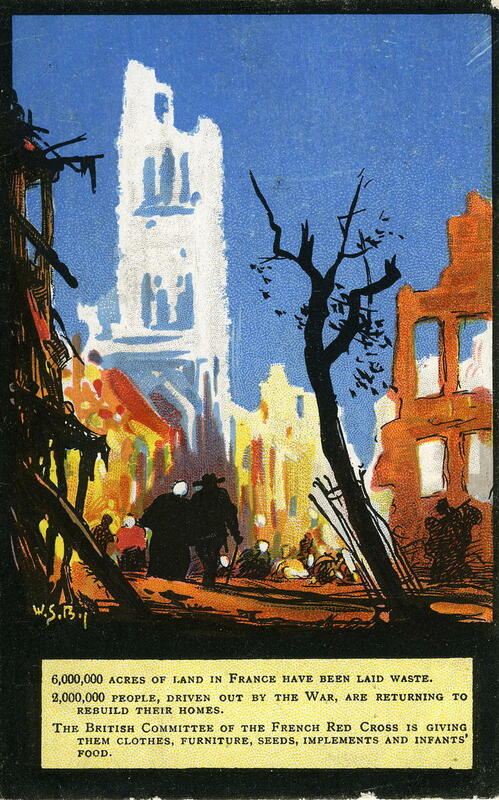 Coloured postcard of painting signed W S Bil issued in support of the British Committee of the French Red Cross. Painting shows civilians in a damaged city. Text on the painting reads: "6,000,000 acres of land in France have been laid waste. 2,000,000 people, driven out by the war, are returning to rebuild their homes. The British Committee of the French Red Cross is giving them clothes, furniture, seeds, implements and infants' food". Reverse of card is addressed to: 'The Hon. Secretary, "France's Day" 34 Wilton Place, London S.W.1." and bears a one penny stamp (not franked). No message.